How to Add an Elevation Layer in HEC-RAS? 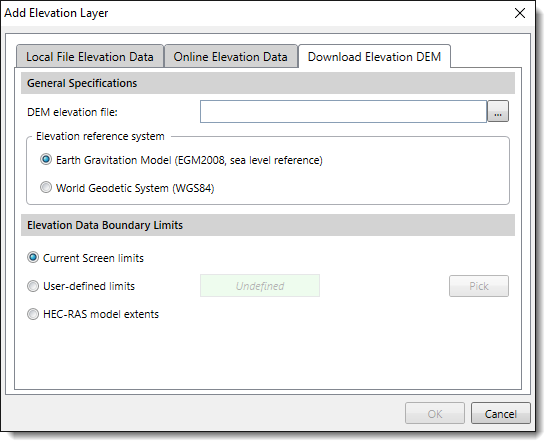 GeoHECRAS can construct an elevation terrain surface from online elevation data sources or through a local elevation data file. US Elevation (10m) – USGS: Accesses the elevation data from the USGS National Elevation Dataset (NED) data server. Elevation data with a resolution of 10m confined to the area within the borders of the United States. Different parts of the United States have different elevation resolutions. The National Elevation Dataset (NED) is the primary elevation data product of the USGS, and is a seamless dataset with the best available raster elevation data of the conterminous United States, Alaska, Hawaii, and territorial islands. World Elevation (30m) – NASA: Accesses the elevation data from NASA elevation data server. Elevation data with a resolution of 30m, derived from the Shuttle Radar Topography Mission (SRTM) data. Different parts of the world have different elevation resolutions. The SRTM obtained elevation data on a near-global scale to generate the most complete high-resolution digital topographic database of Earth. The SRTM consisted of a specially modified radar system that flew onboard the Space Shuttle Endeavour during an 11-day mission in February 2000. 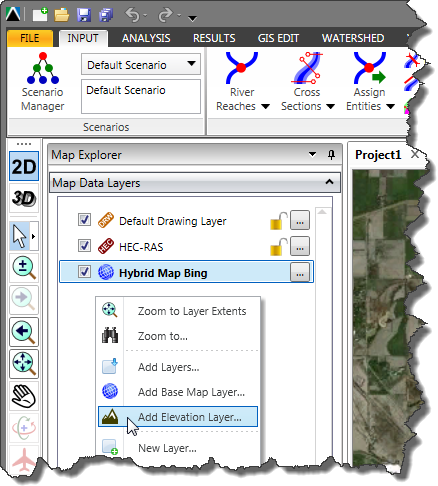 Right-click on the Map Data Layer panel and select Add Elevation Layer from the displayed context menu. The Add Elevation Layer dialog box will appear. Select the Online Elevation Data tab. 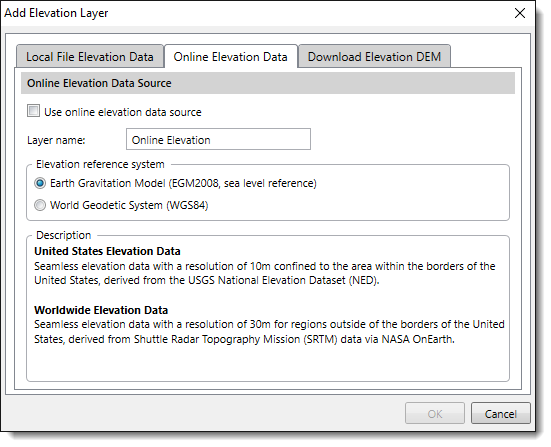 Check the Use online elevation data source checkbox. The software will start to pull elevation data tiles from the selected elevation data source and construct an elevation terrain surface. Alternatively, you can download the data on the local computer as an elevation grid DEM. Choose the Download Elevation DEM tab. You can then specify the boundary limits and where the DEM file should be saved. Select the Local File Elevation Data tab. 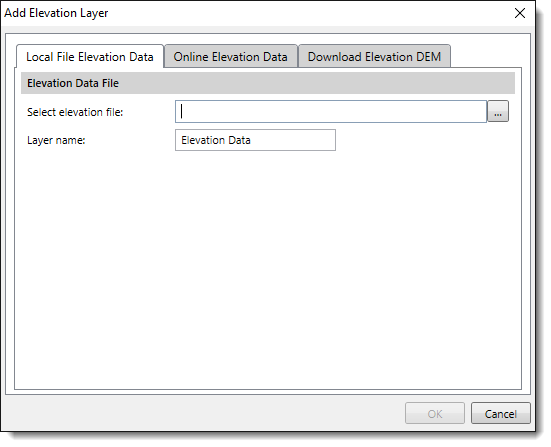 Click on the […] file browse button and select the elevation grid data file to load. The software will load the elevation grid data file as an elevation terrain surface.